Maybe you've heard...there's a hurricane coming this way! I mean, has anyone else been talking about anything else for the last 3-4 days? It's not good for the anxiety-prone like me to turn on the news. Oh, if you cover all the windows in your house except one, and that one window gets blown out, your whole roof may blow off! And please have 1 gallon of water per person for 3-7 days. Gaaaah! It doesn't take much to freak me out. Where on Earth am I going to find 21 gallons of water, when everyone in the state of RI is at the stores buying up every last container of water, milk, and bread? I just went to the store and they only had a few cases of small bottles of water. I am filling jugs at home and praying we don't need it! Whew. This hurricane is making me crazy! I was too rattled to even think about cooking last night. So I just made a big batch of my son's favorite noochy pasta for dinner. I figured all 3 of us could use some comfort food! Bring large pot of salted water to boil. Add ingredients one-by-one based on the amount of time each requires to cook. 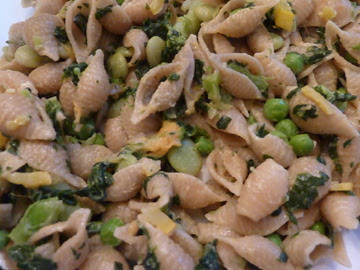 I start with the frozen lima beans (12-14 minutes), then add the butternut squash, pasta, spinach, broccoli, peas, etc. as the clock ticks down. After everything is cooked, drain well and return to pot. 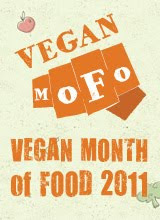 Add Earth Balance, nooch, and Braggs, to taste. What's not to love here? You use one pot (plus one colander), get some whole grains, tons of veggies, tons of protein and B vitamins from the nooch, vitamins and amino acids from the Braggs, and delicious faux-buttery-goodness (and omega fatty acids!) from the EB. Win-win-win! After breakfast, we got cleaned up and then headed to the store to pick up some emergency supplies. For me, that meant: bananas, avocados, tomatoes, a yellow pepper, 2 loaves of bread, some crackers (for my hubby), and 10 cans of organic beans (chickpeas, black beans, cannellinis). Hey, some people were stockpiling Doritos and Coca-Cola; whatever floats your boat! After we got home, I was pretty doggone hungry. Running 8 miles will do that to you :) I wanted to make something quick and filling. 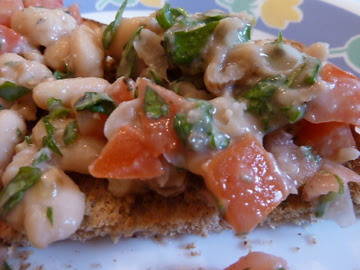 Since I had just bought tomatoes and still had a bunch of basil left, I thought of the White Bean & Walnut Bruschetta from Eat, Drink & Be Vegan. Only, instead of serving the topping on crostini, I just toasted up 3 slices of the bread I just purchased and put it on top of that. Easy peasy! 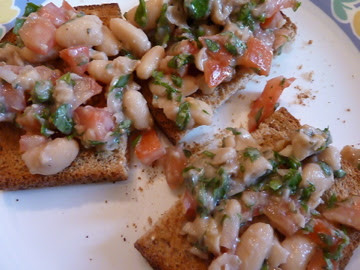 This was exactly what my body was craving - beans, nuts, veggies, and bread!